Hi! 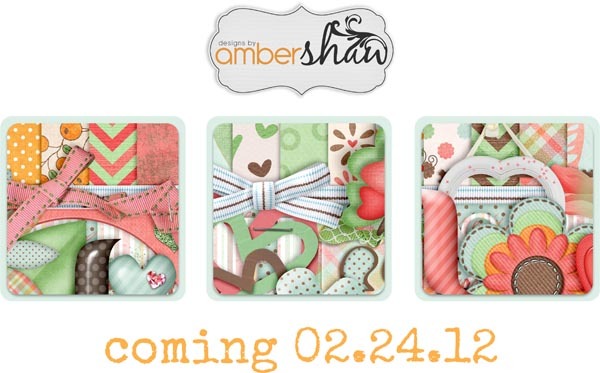 Deanna here, and I'm privileged to give you your first glimpse of the new Sneak Peek of a kit coming very soon to a store near you!! :) Amber has teamed up with Roseytoes and they have come up with a stunner! I can't wait to see it in person in fact, and you are going to just love it!! I love everything that can be seen!! Aren't the colors just wonderful? Can you wait? If you are like me, the answer to that would be NO! Well if you love it, make a comment on THIS post no later than 2/23/12 and be entered to win this kit! How is the weather in your area? I live in Southern California, but today you'd never know it!! It's cold and windy, and looks like it could snow any minute. We'll probably only get a little sprinkle though!! Summer will be here before we know it though--so I've decided to enjoy this cold and windy day by curling up by the fireplace with my trusty dog!! I might even drink some nice hot tea!! Those of you on the East coast probably think I'm a whoos!! Well, I probably am--but I'm gonna be a warm one!! Thanks for stopping by today!! Keep your eye out for Amber's new kit!! Fun combinations of yellows, reds, greens and blues in this! Happy Valentine's Day!